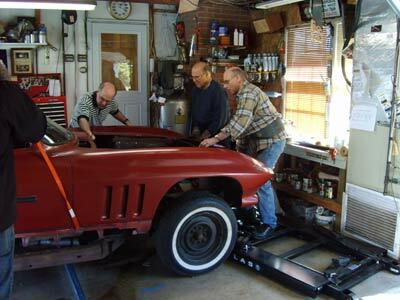 We spent a recent Sunday helping a friend take the body off the frame of a 1966 Corvette coupe. It will take 800 - 1000 hours of work and as much as $25 thousand to restore the car but these mid-year Corvettes appreciate in value at an amazing rate. Typical of frame-off restorations, the body needs to, well, come off! That means, in the case of this Corvette, the construction of a rolling cart on which the body will rest - and be worked on to a fairly great extent. 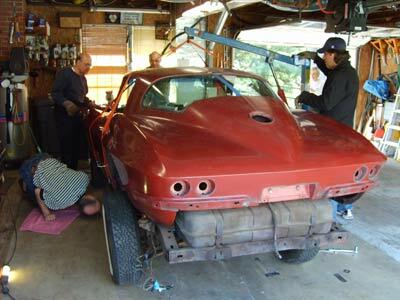 The owner of the Corvette got the plans for a cart online (see Corvette Dolly Plans) and built it beforehand. 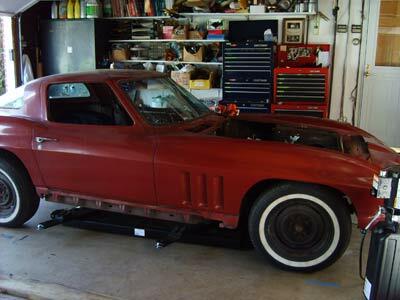 He benefited from the experience of thousands of Corvette restorers before him and the cart proved to be simple and inexpensive to make. It only took a bunch of 2X4's, screws, plywood and casters and it will keep the body about 18 inches up from the ground to allow access underneath. The owner also disconnected everything that was attached to the body (well, one thing was missed but more about that later) or interfered with removal of mounting hardware. This included the wiring harness, speedometer cable, steering column, exhaust, light fixtures, accelerator and shift linkage and assorted other things. It took him about a day to do all the prep work on the car. On the "big day" he assembled five willing-and-able helpers, including us, and rented an engine hoist for use in lifting the body. 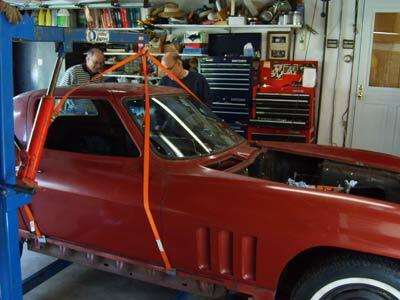 He bought a set of Corvette lifting straps from a restoration supplier and these were relatively simple to attach as opposed to creating a lifting jig from rope or generic strapping. Each helper was assigned a task. One would guide the body at each end, one would operate the crane and one would attach and monitor the lifting straps on each side. Lifting straps are attached and we are ready to go. Things went pretty smoothly in the beginning as the body slowly rose off the frame, but once it was up about 3 inches the rear axle started to lift off the floor. The body seemed to be attached somewhere in the middle and was pivoting from end to end. We stopped the process, lowered the body back to the frame and raised the car up on to jack stands to inspect things underneath. All that's needed is a little guiding. It took a while but we found where the body was still attached to the frame. It seems that the designers of the car needed to create a solid mount for the center seatbelt attachments so they welded a bracket onto the "X" part of the frame. Two mounting plates attached to a strong steel cable threaded through the bracket and were mounted to the seatbelt bolts where they passed into the driveshaft tunnel. It was a bit tricky to get wrenches on the nuts but the brackets were eventually removed. OK, the problem has got to be under here somewhere. The body then came off quite easily and the engine hoist raised it just high enough to clear the chassis. We then slowly rolled the crane sideways so that the chassis could be rolled out and the wooden cart rolled in. 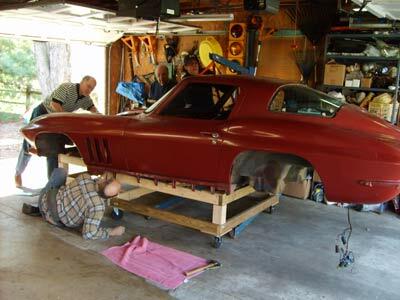 The body was lowered and carefully positioned on the cart, after which it was moved to its bay in the garage. With a little adept directing, it looks like we are making progress. 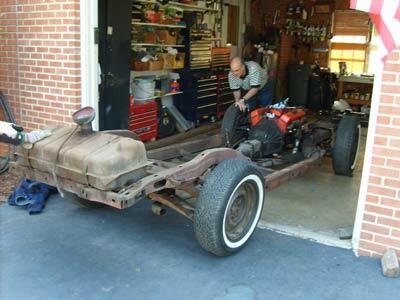 For now the body will rest on the cart while the chassis is stripped of all mechanical components. The frame will be pressure washed and wire brushed, then primed and painted. The engine, transmission and rear axle will be rebuilt and the suspension components replaced. The wiring harness from the dash out into the engine compartment will also be replaced, as will the brakes and steering parts. 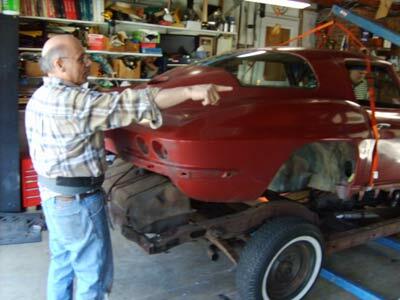 The body will be stripped down to the bare fiberglass and brought back up to a near-perfect finish. This will be time consuming and expensive but shortcuts can't be taken here. Flaws always show in the paint if things aren't done properly and fiberglass bodies require a delicate touch. Here's where the body is going to roost for the next couple of years.